The private dining room of David Chang’s Momofuku Ko was the site of this recent birthday dinner. Food, wine and service were all terrific, but as always, it’s the people who make a celebration truly special. Over the years, this group has tasted some pretty memorable wines together. That was once again the case on this night. Sommeliers Jordan Salcito, Chase Sinzer and John Slover did a fabulous job keeping up with the pace and ensuring each wine was served at the optimal temperature. I thought the food was delicious, although not everyone at the table agreed. Each dish was quite simple and stripped down to the basics, which really allowed the laser-like focus and purity of the flavors to come through. The menu descriptions don’t do full justice to what was on the plate. For example, the Black bass tartare was topped with more of a cold consommé gelatin that was both refreshing and flavorful. The razor clams, served in a roasted pineapple and basil broth, was intriguing, if not especially wine friendly. Ko’s soft-boiled egg and lobster courses were both fabulous. And the wines? Epic. The 1988 Krug Vintage is exceptionally beautiful. Bright, intense and pulsating with the signature energy of the vintage, the 1988 is a fabulous way to kick off the night and a terrific example of this wine. Hints of dried pear, smoke and slate add the closing shades of nuance. We are off to the races. 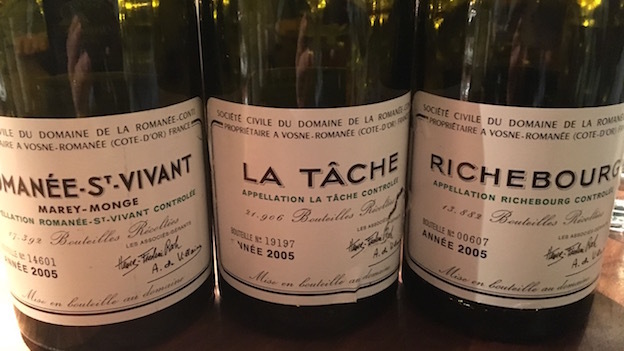 A last minute addition to the lineup, Domaine de la Romanée-Conti’s 2005 Romanée Saint-Vivant opens with the most extraordinary, alluring bouquet imaginable. Silky, nuanced and super-polished on the palate, with exceptional purity, the 2005 simply soars out of the glass. The classic weightlessness of RSV comes through loud and clear. Bright saline notes give the 2005 a closing kick of freshness. The 2005 is a very pretty wine, although the profoundness of the aromatics doesn’t fully follow through to the palate, where the wine is a bit slender, especially compared to what follows in this flight. I’ve had better bottles of the 2005. The 2005 La Tâche is simply magnificent. There is not too much I can add. Deep, powerful and richly textured, the 2005 simply has it all. Time in the glass releases the aromatics, but it is the wine’s pure sensuality I find most enticing. A host of dark red and blue stone fruits, hard candy and wild flowers take center stage. Even with all of its intensity, the 2005 retains striking freshness and purity. Can it get better than this? The 2005 Richebourg makes a strong argument that the answer to that question might be a resounding ‘yes!’ Huge beams of tannin are present but nearly covered by the sheer intensity the fruit. Black cherry, plum, mint, lavender and graphite give the 2005 much of its gravitas. Tonight, the 2005 is insanely beautiful and absolutely stellar, and I say that never having truly fallen for the domaine’s Richebourg. The 2005, though, well, it simply will not be denied. Bollinger’s 1982 R.D., disgorged in 1995, makes for a great palate cleanser. Mature, but with enough freshness to drink well for at least another handful of years, the 1982 is a fabulous example of just how well Champagne can age with proper storage. Hints of almond, chamomile, mint, dried pear and baked apple leave a lasting impression in this super-polished, silky Bollinger. The 1982 retains quite a bit of freshness, especially considering it was disgorged more than a decade ago. A dark, exotic beauty, the 1999 La Tâche hits the palate with scents of soy, blackberry, licorice, grilled herbs, smoke, graphite and lavender. 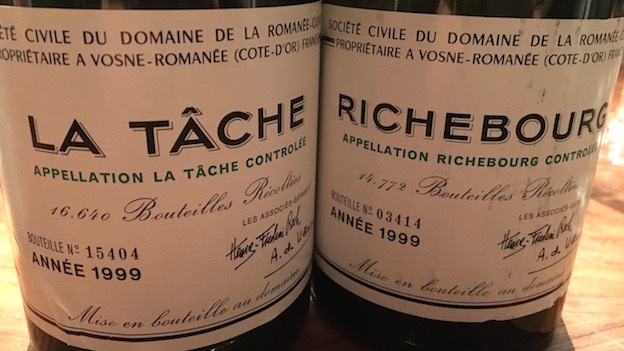 The 1999 is a distinctly brooding, dark La Tâche that speaks with a real sense of gravitas. Just at the very early part of its drinking window, the 1999 will offer profound drinking over the next several decades. The 1999 Richebourg is simply majestic. 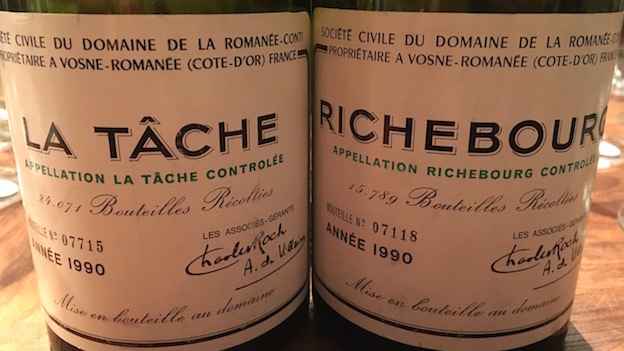 In fact, 1999 may be a year in which the Richebourg is just a bit more complex than the La Tâche. Hoisin, smoke, exotic spices and rich, unctuous fruit flesh out in the glass. The 1999 has more than enough fruit to fill out its big, broad frame. It, too, will drink well for several decades. The 1990 La Tâche saturates the palate with extraordinary depth and intensity. Hoisin, mocha, exotic spices, leather, licorice and plums meld together in the glass. Powerful and unctuous to the core, the 1990 has it all. This is an especially fine bottle of the 1990. Wow! The 1990 is ripe, voluptuous and racy, yet it retains just enough freshness to balance all of the intensity. The creamy, unctuous finish alone is captivating. This is a fabulous bottle of the 1990 and a total dream wine. Sadly, the 1990 Richebourg is flawed. The dried-out flavors, slender construction and metallic finish are all uncharacteristic of both this wine and vintage. This is a disappointing bottle. 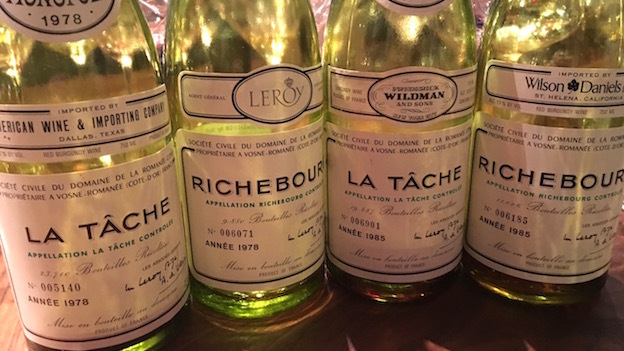 Over the years, I have had mixed experiences with the 1990 Richebourg. The 1985 La Tâche is soft, pliant and accessible, but also comes across as a bit oxidized and volatile. Unfortunately, luck is not smiling upon us with this bottle. I have had better bottles of the 1985 Tâche, but none that have ever been truly moving. 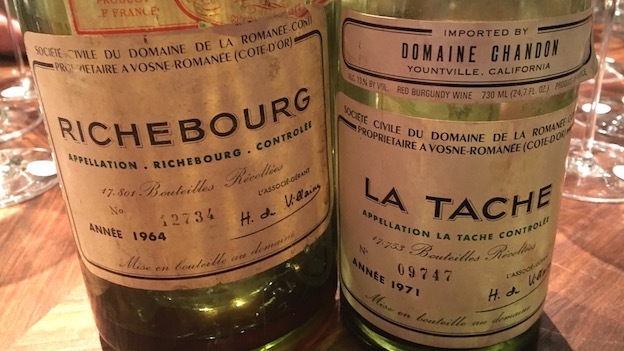 There is a lot to admire in the 1985 Richebourg, is a decidedly lifted, perfumed Burgundy endowed with striking aromatics, mid-weight structure and fabulous overall balance. The 1985 won't last forever, though, so it is best enjoyed sooner rather than later. Scents of orange peel, Campari, herbs and dried flowers add myriad shades of nuance. I absolutely adore bouquet here. Served alongside the lobster dish, the 1995 Montrachet, is highly enjoyable, if not quite as opulent as it can be. Orange blossom, lemon confit and white flowers add nuance throughout. At its very best, the 1995 is a racy, flamboyant Montrachet with considerable botrytis-inflected oiliness. By that standard, this bottle is a bit subdued. The 1998 Montrachet is a perfect wine for drinking now, as all the elements have come together nicely over the last few years. Scents of white truffle, popcorn, butter, orange peel and apricot jam add nuance throughout. 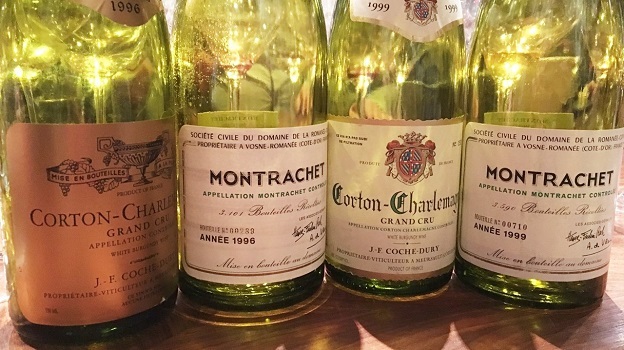 Veins of sweetness give the 1998 much of its oily, sensual personality, yet the 1998 remains a distinctly mid-weight wine with hints noticeable botrytis inflections, but less of the sheer opulence than is often found in the domaine’s Montrachet. The 1978 La Tâche is laced with the essence of blood orange, herbs, mint and sweet spices, all of which give it an unmistakable sense of exoticism. As it usually is, the 1978 is a touch slender and fleeting, so it is best enjoyed sooner rather than later, before the fruit dries out too much further. This bottle is arrestingly beautiful. Scents of white truffle, blood orange and cherry reappear on the super-expressive finish. One of the many highlights of the night, the 1978 Richebourg exemplifies everything aged red Burgundy can be. White truffle, white pepper, cherry, dried rose petal, mint and blood orange give the 1978 its unmistakable exoticism. Precise and chiseled throughout, the 1978 is another absolutely irresistible, compelling wine. The finish is eternal, as will be the memories from this great, great bottle. Coche-Dury’s 1996 Corton-Charlemagne is deep, unctuous and bit deeper in color than I would like to see for this wine. I very much admire the wine’s power, but this is not a great, or even, very good, bottle. When the 1996 Charlemagne is on, it is tremendous. Sadly, that is not the case on this night. I much prefer the 1996 Montrachet from DRC in this flight. Crystalline, with the purity of water from an Alpine mountain stream, the 1996 is all finesse. Lemon peel, lemon confit, white pepper, apple and bright floral notes float across the palate in this striking, tightly wound Montrachet. Drinking the 1996 Montrachet can be a quasi-religious experience. This bottle falls short of that, but not by much. This pairing of 1999s is one of the highlights of the evening. The 1999 Corton-Charlemagne is initially quite reduced. Over the years I have learned that the Coche Charlemagne needs a lot of air. That is certainly the case on this night. The flavors are intense, brilliant and beautifully focused, especially as the wine starts to open up. White flowers, candied lemon, white pepper and pulsating saline notes meld into the austere, tightly wound finish. I imagine the 1999 will be a magical wine for many years to come. If opened young, it requires considerable aeration. A fabulous bottle of the 1999 Montrachet from DRC follows. Deep, powerful and phenolic in its impression of weight, the 1999 is magnificent tonight. Hazelnut, pastry and butter are some of the notes that fill out the wine’s ample frame. The 1999 is a bold, almost arrogant wine that demands attention. It has mine, that’s for sure. Dried rose petals, autumn leaves, sweet tobacco, cinnamon, orange peel, mint, leather and anise lift from the 1964 Richebourg. Striking in its depth and overall persistence, but also fully mature (if not slightly past peak) the 1964 offers little upside from further cellaring. Even from magnum, the 1964’s time has come. Another of the many highlights of night, the 1971 La Tâche is sensational. Vivid, alive and totally electric in the glass, the 1971 dazzles from start to finish with seemingly endless layers of sweet fruit and captivating aromatics. This is an especially moving bottle. The only better bottles I have had have been large formats. 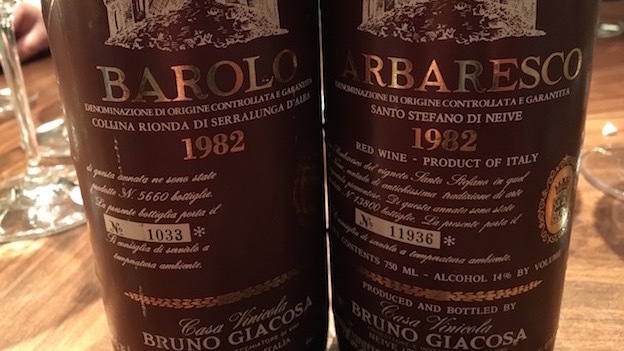 Two 1982s from Bruno Giacosa are an unexpected but very welcome surprise. I have always adored this vintage. Both wines more than live up to my expectations. I am also quite surprised by how translucently beautiful the wines are. Giacosa’s 1982 Barolo Riserva Collina Rionda is aromatically haunting and sweet on the palate, with plenty of bright red stone fruit and rose petal notes. My only critique is that the aromatics aren’t as fresh as they are in the very best bottles. Ultimately, that’s a pretty small critique for a 34 year-old Barolo. The 1982 Barbaresco Santo Stefano Riserva simply has it all. Deep, pliant and explosive, the SSR is also quite bit fresher than the Rionda. Here too, the flavors pack considerable brightness, with plenty of blood orange, cranberry, dark cherry and tobacco notes. Quite simply, this is a great, great bottle of the 1982 SSR. What a way to end the night.